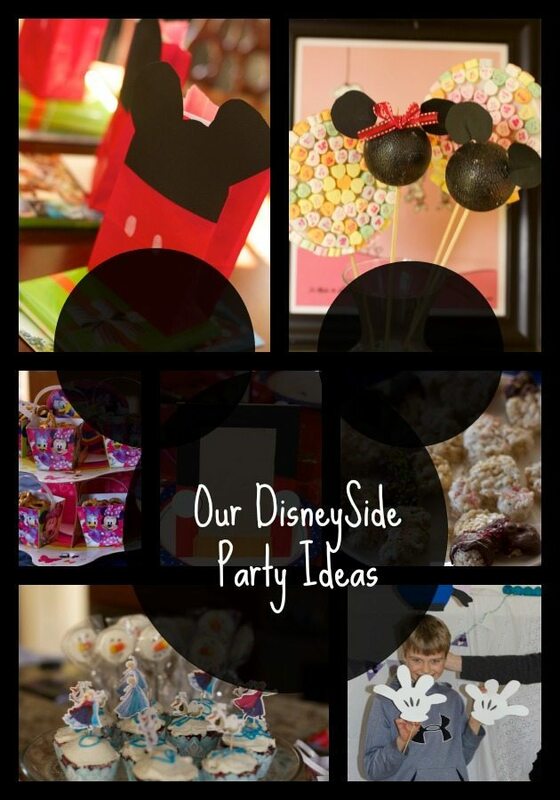 I was provided a box of #DisneySide products to inspire our DIY Disney Party ideas. All the opinions expressed are 100% our own. 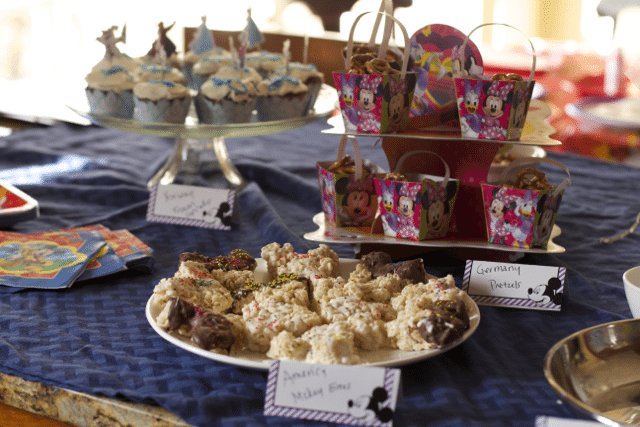 We were fortunate enough to throw our second DisneySide Party this year. We have previously shared a few of our Disney Decorations like our Mickey Mouse Wreath or our Mickey Themed Invitations. 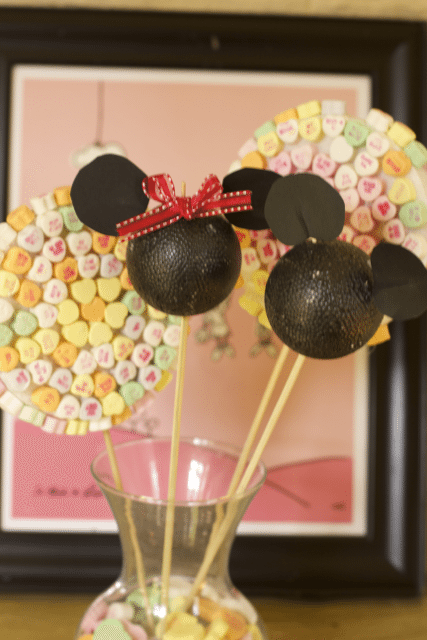 You don’t want to miss our Mickey themed Disney themed foods such as our Mickey and Minnie Chocolate Covered Strawberries and our yummy chocolate-covered marshmallows in previous posts but wanted to share our party with you today. Hosting a Disney party for 13-8 year old, both girls and boys, you never quite know when they will stop wanting to participate. 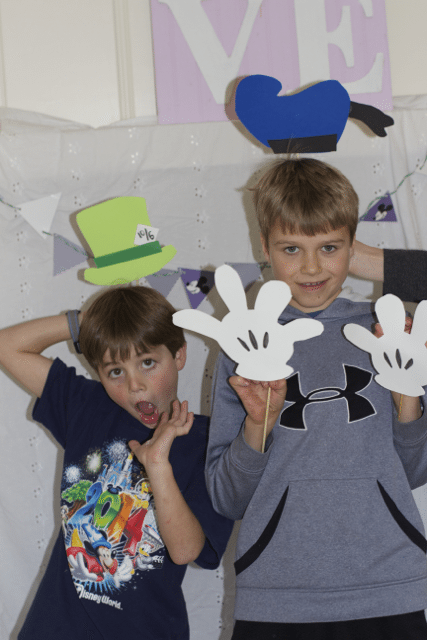 When the kids first arrived they were greeted with our Disney Themed decorations, there were no questions a Disney Party was happening. 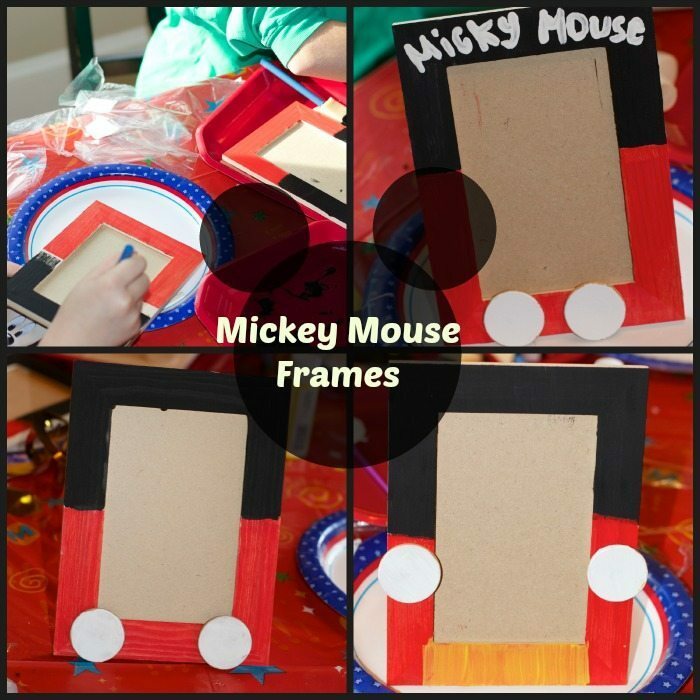 For time sake, once they arrived, I had them make this adorable Mickey Mouse Frames. All you need are some inexpensive unfinished wood frame s, acrylic paints in red, blue, white and yellow (optional) and wooden circles or large white buttons. We also did some trivia games which the winner was given a prize. Of course even at this age they love a little pin the smile on Mickey Mouse game. We had our Disney photo booth again which are always a hit at parties. Plus the kids can use the photos we took at the party and put them in their new frames. 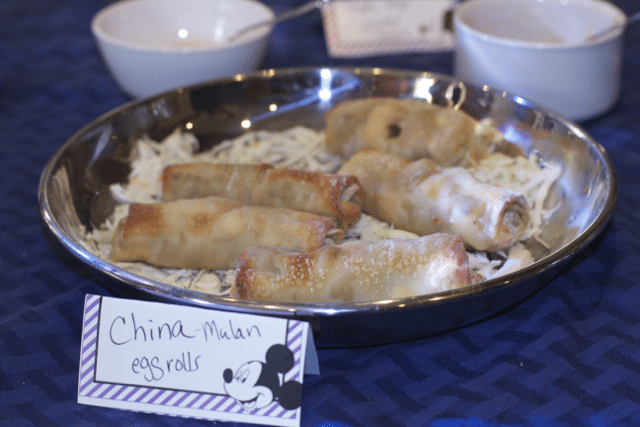 Fun and delicious Disney Party food is the key to any successful party with kids. We decided to label our dishes with Epcot themed names. What a hit to have Frozen Themed foods that also correlated with countries at Epcot. Germany pretzels, Mulan’s Baked Egg Rolls., Mickey’s Ears, French Cheese and cracker. I think you get it. 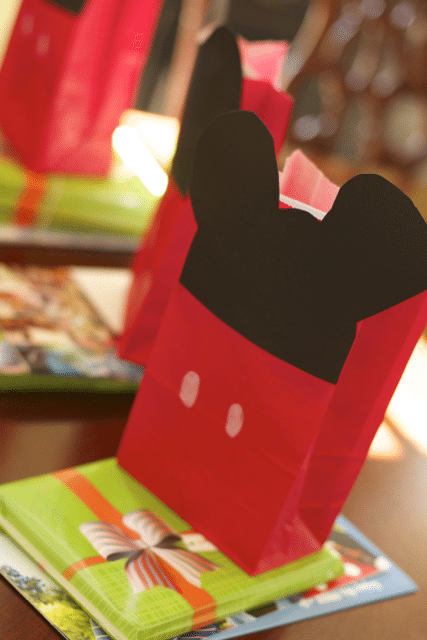 Everyone left with a generous size gift bag compliments of the Disney Parks and BSMedia . How would you show off your DisneySide at your party? What activities would you add? These ideas are so cute!! 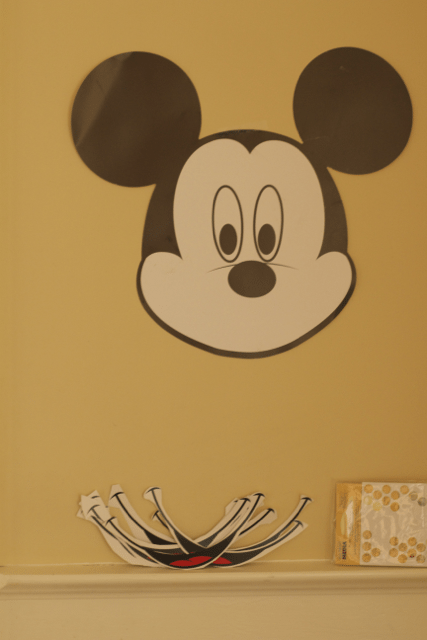 I absolutely love the pin the smile on Mickey Mouse! OH I love the picture frame idea! Such a cute craft!! Such fun party ideas. My daughters love Micky and it sounds like such a fun way to have a party. Such adorable ideas! I love that you incorporated Epcot! OMG, you guys look like you had a marvelous time. Thanks for showing your Disney side. I love these ideas. I was thinking about doing a Brave themed movie night and this post has given me some ideas. Thank you. Those boys looked like they were such good sports for this! Wow! You put together some awesome stuff! You’ve given me great ideas for mine! I have mine on Tuesday and am at a loss! Looks like a great Disney Side party this year. I’m loving all the Disney ideas that you came up with. Olaf!! And hurrah for the great ideas here. 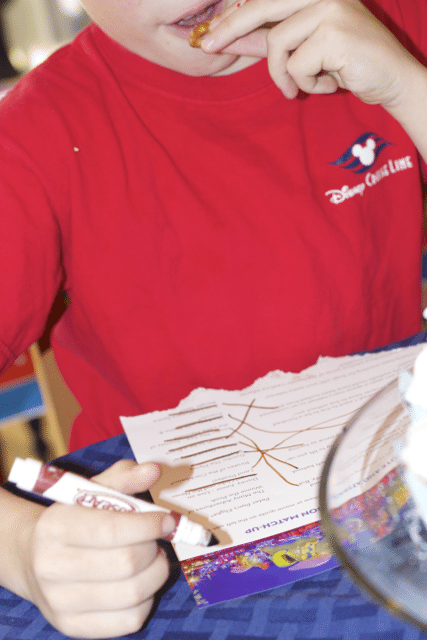 I love the Disney smiles…that’s a good one! I love every single one of these! So many cute and clever ideas! Love the put a smile on Mickey game! Looks like a really fun party, with yummy treats. I’m sure your kids had a blast! The Mickey Mouse frames are adorable! It’s a project that looks easy enough for even my 3-year-old to do! Lots of great disney and mickey ideas! Love it! I was going to do a Minnie Mouse party for my 3 year old niece but we decided on Doc McStuffins instead. The Mickey Mouse frames are adorable! I know my kiddos would love to put their favorite Disney World photo in there to display in their room! Looks like you guys had a ton of fun! I would probably go back to Disney’s beginnings and add oswald too! This looks like such a fun party! Great ideas!! Great fun! I love the frames and the pin the mouth on Mickey game! I love all things disney. We just took my mom to Disney for the weekend for her 68th Birthday. Oh My too cute! Disney makes such a great party theme! 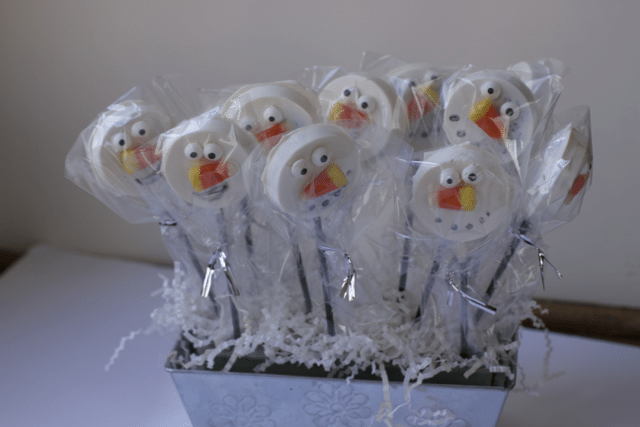 I think we are going with an Olaf theme for our party. Not 100% sure, but you have some great ideas.